AT&T and Verizon's battle to deliver lightning-fast LTE wireless network speeds to its customers is expected to heat up this summer. Verizon may have a jump on AT&T, for now, but don't write-off AT&T just yet. Its upcoming LTE network is shaping to give Verizon a run for its money when it launches this summer. Verizon Wireless announced Monday that it will be bringing LTE service to mid-sized markets including State College, Penn., Indianapolis and Greenville-Spartanburg, SC on June 16. 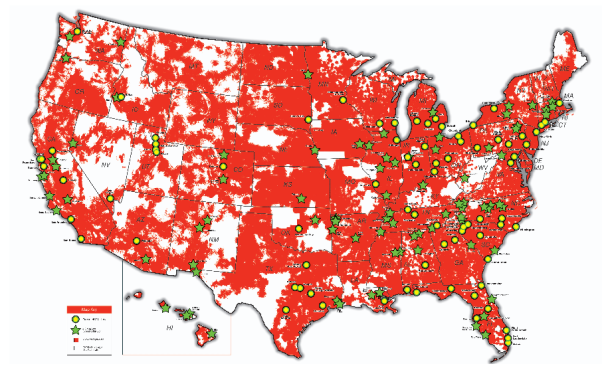 Verizon LTE launched in December and is currently available in over 50 markets and even more airports nationwide. The company claims its LTE network allows eligible wireless customers to receive data download speeds of between 5 and 12 megabits-per-second and upload speeds of 2-5 Mbps-that's roughly ten times faster than the commonly reported speeds for Verizon's existing 3G network. The nomenclature around LTE networks can be confusing, as they're often marketed as 4G networks, despite not fully complying with 4G requirements, they're often more accurately referred to as a pre-4G technology. Meanwhile, AT&T has demonstrated an experimental LTE network in suburban Dallas capable of speeds up to 29 Mbps-that's much faster than anything currently offered by any carrier but still well below the specs for LTE, which allow for download peak rates of at least 100 Mbps. "Our approach is well-known... the technology is called Long Term Evolution for a reason." Whenever AT&T's LTE service debuts, it's likely to have a ways to go to catch up to Verizon, regardless of the speeds offered by the competing carriers. But perhaps the biggest wild card in the battle over the next-generation of data networks will be when an LTE-capable iPhone will appear on the market and which carriers it will support. And Apple says we'll have to wait until at least 2012 for the answers to those questions.